Description: Bold and beautiful with a vintage inspired design. 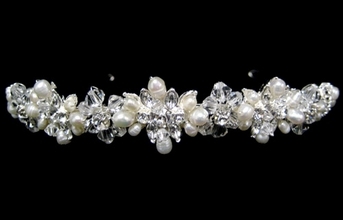 A combination of sparkling Swarovski crystals, dazzling encrusted austrian rhinestones and elegant freshwater pearls creates a beautiful soft yet elegant look. measures approximately 1/2" with a loop at each end for bobbie pins.